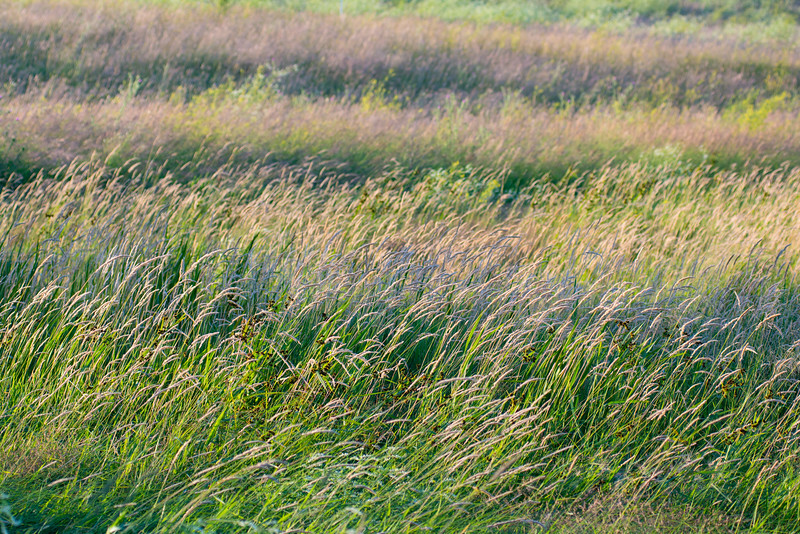 Maintaining prairie and wetland habitats in Minnesota is extremely important. 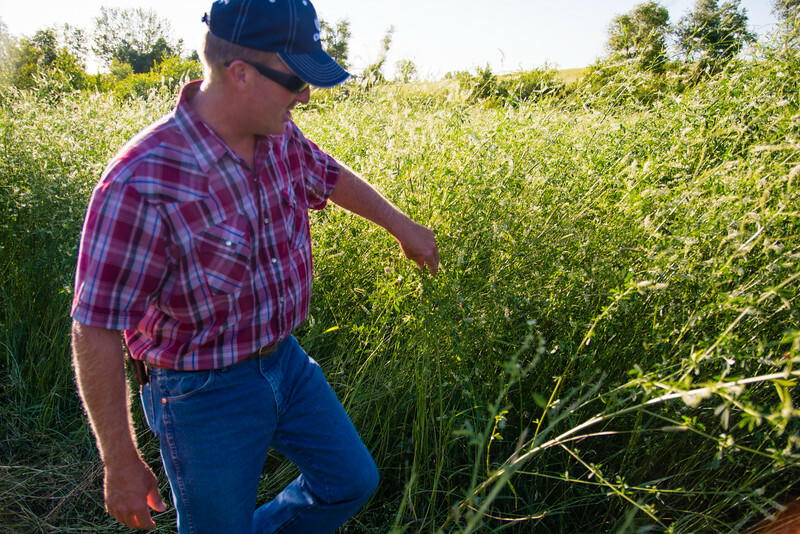 A functional prairie landscape has the capacity to adapt to changing environmental conditions and support sustainable populations of fish, wildlife and native plants, as well as compatible economic uses. 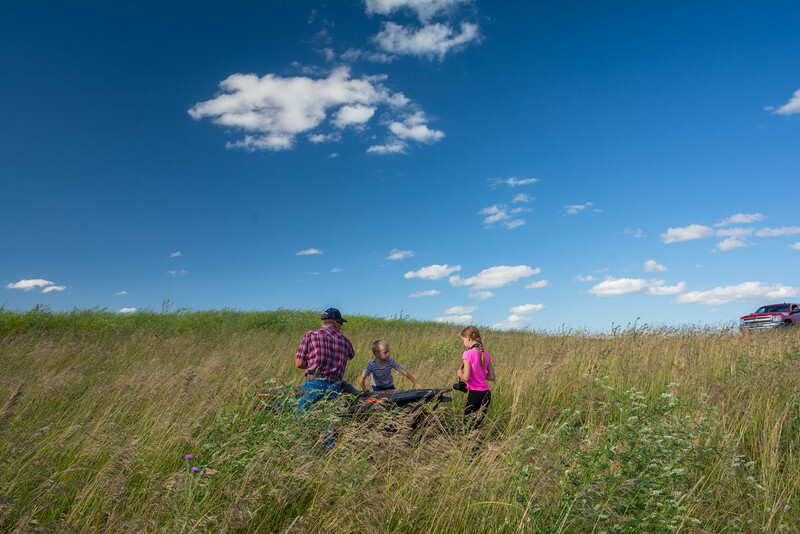 The Minnesota Prairie Conservation Plan calls for three approaches to conservation in the Prairie Region: maintain a minimum of 40% grassland and 20% wetland in cores areas, establish habitat corridors to connect core areas with grassland/wetland complexes, and maintain 10% grassland/wetland habitats outside the core areas in the Prairie Region. With the Grasslands for the Future grant from the Outdoor Heritage Fund, the Minnesota Land Trust ( http://www.mnland.org) is working in partnership with the Minnesota Board of Water and Soil Resources (BWSR) and The Conservation Fund to help achieve the goals established in the Minnesota Prairie Conservation Plan by protecting land through conservation easements, land acquisition, and effective land management. This is the Berge family (well, most of the family, one daughter is absent) backed by their herd of cattle. 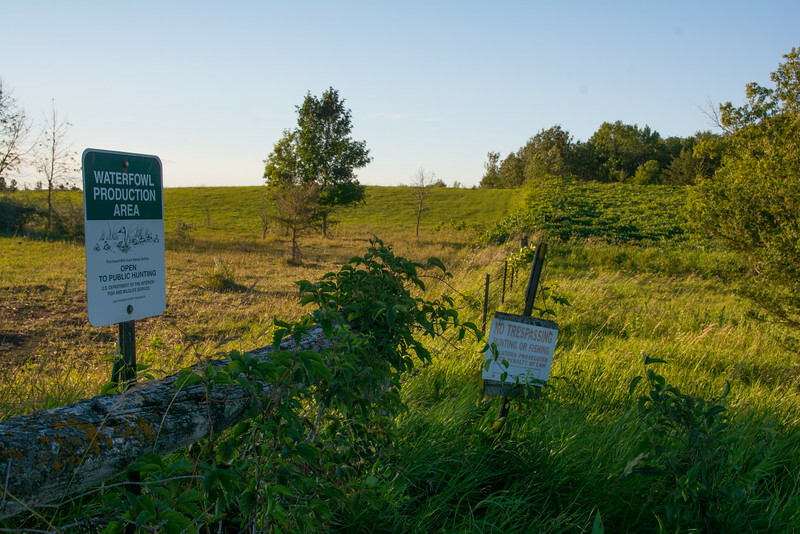 In February 2015, the Berge family did something unique and extremely important with 284 acres of their grazing land by entering it into a conservation easement with the Minnesota Land Trust. 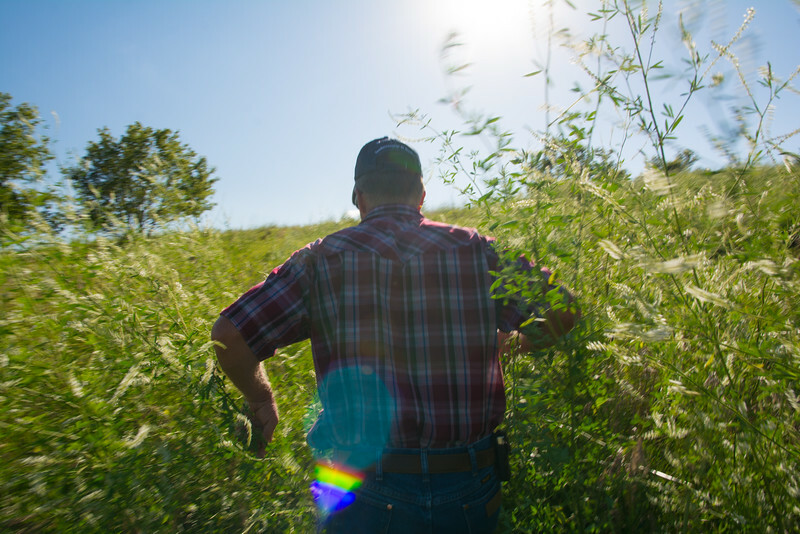 The conservation easement establishes a permanent conservation grazing system that creates and maintains critical grassland habitat while providing sustainable income for the family. 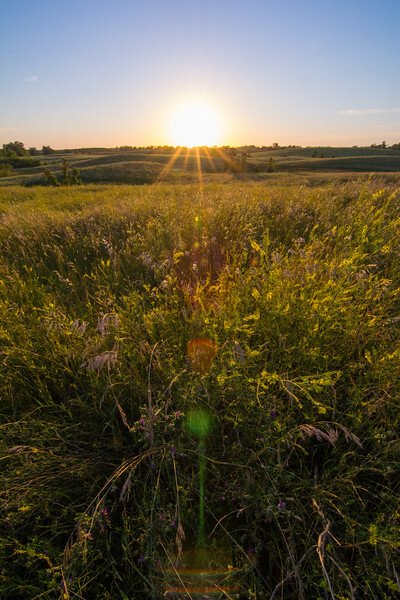 Located in the Glacial Lakes Prairie Core Area, the Berge property is a stunning combination of rolling prairie grassland, pothole ponds, wetlands and woodlands. This landscape is something that I, as a suburban dweller living in Eden Prairie, was not used to seeing in Minnesota (ironic, isn’t it?). I was truly amazed at the beauty of this place. 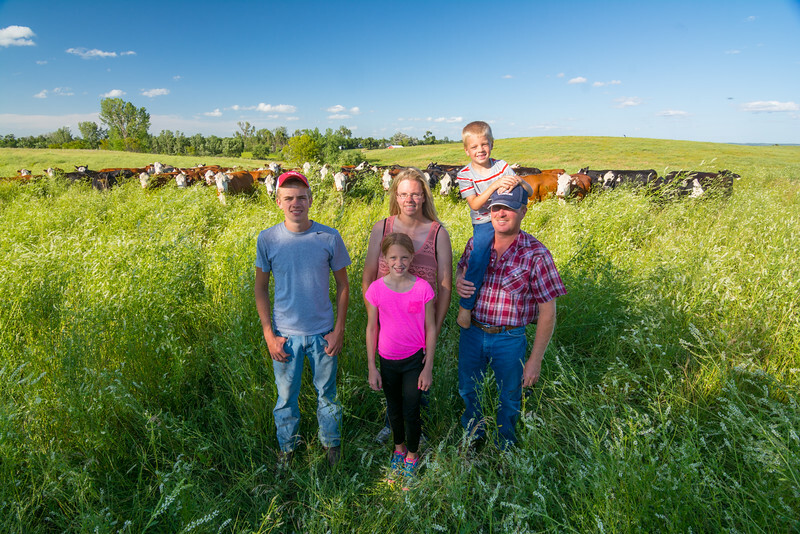 Jess and Tammy Berge are first generation cattle farmers, which is an increasingly rare livelihood in Minnesota. Jess even told me that there are more people becoming astronauts than there are people becoming cattle farmers in Minnesota. Before agreeing to enter their land into the conservation easement, the Berges worked their property for about 10 years using typical cattle grazing methods, which lead to overgrazing, increased runoff into lakes and streams, a general loss of prairie and wildlife habitat, and smaller, lower value livestock. Jess and Tammy were struggling to maintain a profitable business. Jess began educating himself about sustainable alternative grazing methods that would support small operations like his. 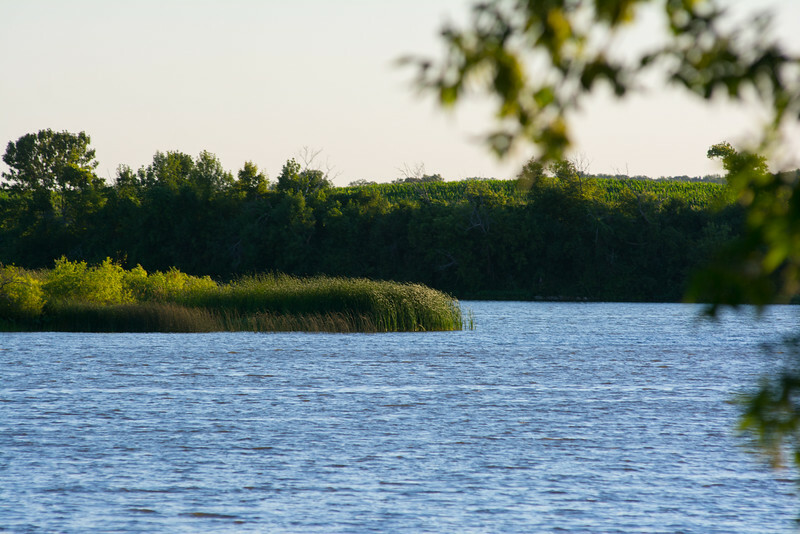 Eventually, the Berges found the Minnesota Land Trust, and together, they entered the land into a conservation easement and developed a permanent conservation grazing plan. 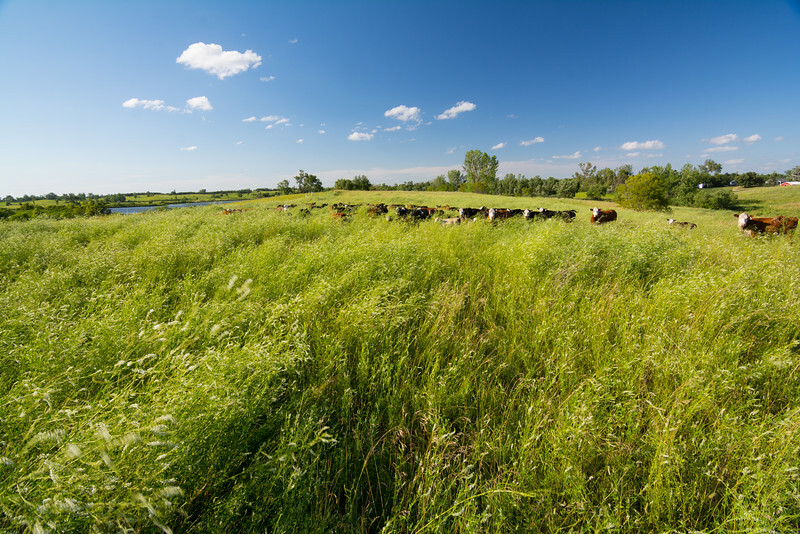 Basically, this plan lays out a permanent, environmentally responsible grazing system to restore valuable native prairie grassland and to provide the Berge family with an economically viable cattle-farming operation. 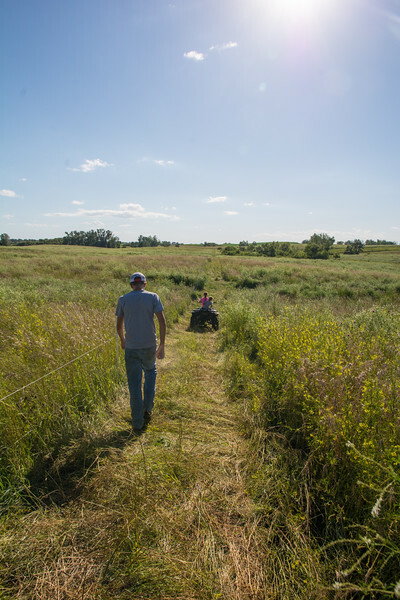 This unique partnership results in a habitat that closely resembles the prairie grassland in Minnesota that existed 150 years ago. The property is split into a series of grazing paddocks. 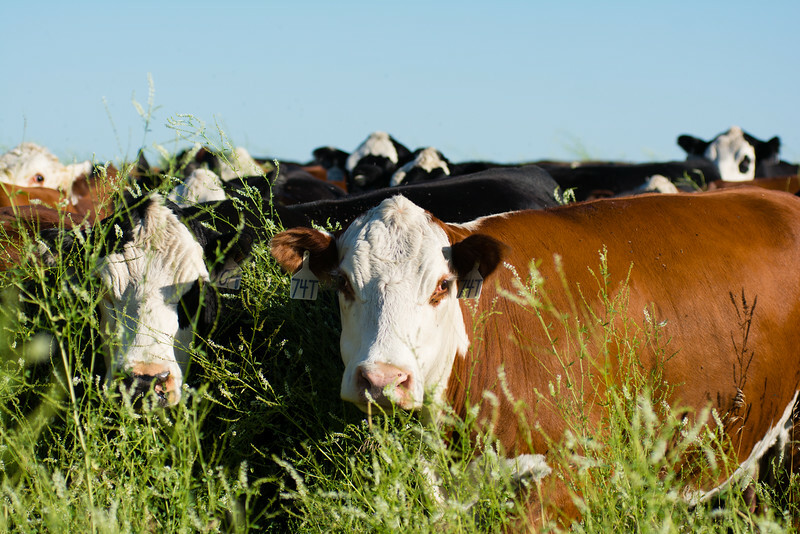 The cattle are placed into an single paddock and engage in "intensive rotational grazing" where they forage the plant matter down to a specific height. When the vegetation in the paddock is grazed, the cattle are switched to the next paddock, allowing the grazed paddock to recover. Maintaining a specific vegetation height is critical to allow plants to recover. If the vegetation is grazed too low, the plants will not be able to use their leaves to produce food and instead will deplete their root reserves before the plant can recover, eventually killing the plant and the cattle's food source. 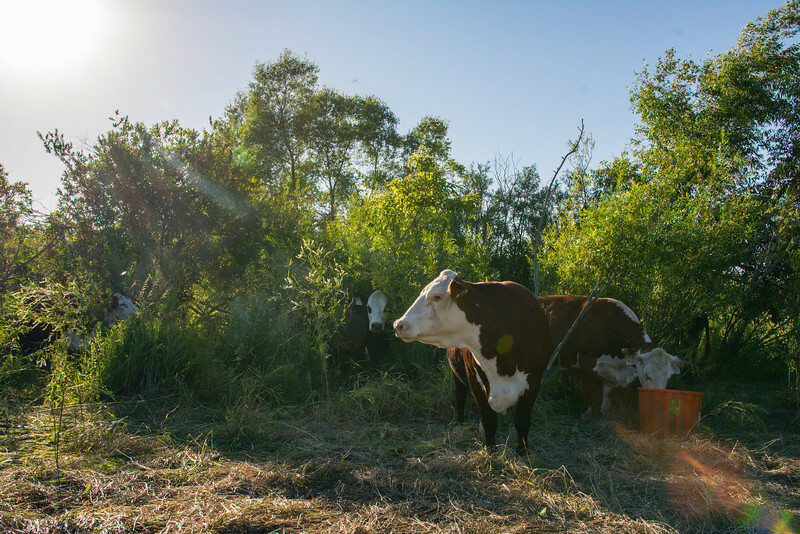 Overgrazing is the most common problem of traditional grass-fed cattle farming and is the cause of other problems associated with cattle operations, such as runoff and erosion that degrades the quality of lakes and streams. When I visited the property in July, Jess and Tammy were eager to give me a tour of the property and to show me the benefits that will come from this plan. Prior to initiating grazing, the property was seeded with hearty grassland species that flourish in a prairie environment are are high in protein. 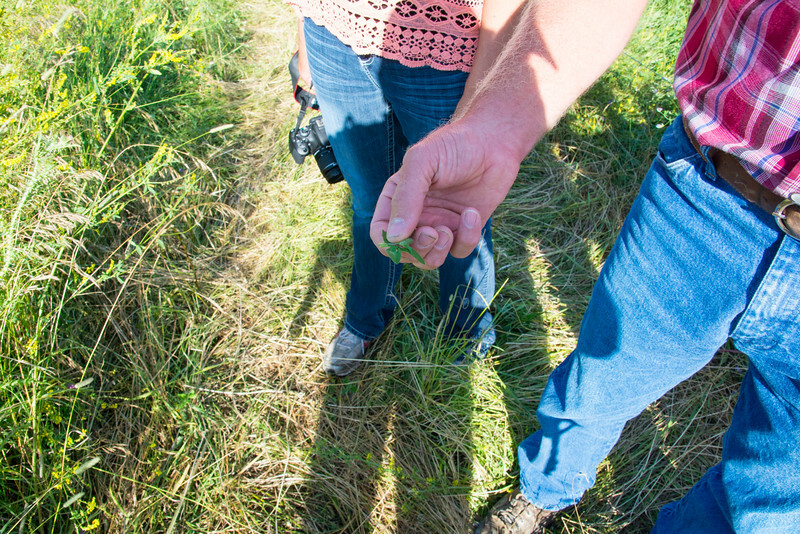 Plants with broad leaves like this clover provide tons of protein not found in grasses on typical cattle grazing land. This type of vegetation is essential for raising stronger, healthier cattle more quickly, necessary for a successful and sustainable cattle-farming business. Jess showed me that as the cattle graze and stomp the vegetation to various heights, the flattened vegetation creates good cover and food that is beneficial to birds like pheasant, a species that is currently in severe decline in Minnesota. The hoof action of the cattle will also push some of the vegetation into the soil. 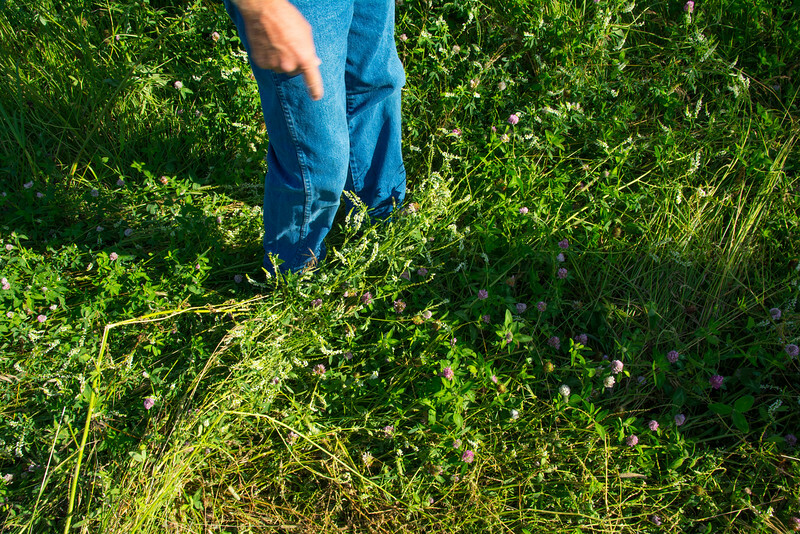 According to the Conservation Grazing Plan, this action helps feed and loosen the soil and provides excellent water infiltration and ground cover to prevent wind and water erosion. No paddocks had been grazed at this point in the season, so the vegetation was fully grown and ready to be eaten. On our way to find the heard, we had to battle our way through growth that was taller than me! Without managed cattle grazing, prairie land can become overgrown with trees and shrubs like this. 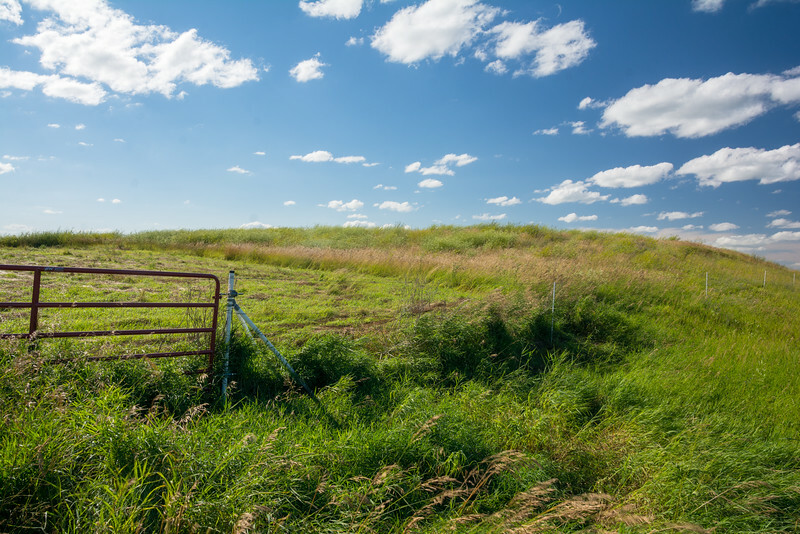 The common misconception that land is best left untouched is not true in today's world for prairie ecosystems with the absence of historic grazers such as bison. The Berge property is critical to the connectivity to other state and federal protect lands, including waterfowl production areas like this one (left) located directly to the north of their property. Connectivity allows animals to migrate without having to risk traveling through developed land such as cropland or residential developments. Biomass is conserved using this grazing method as well. As the vegetation is trampled, some of the biomass is recycled back into the ground and nutrients are also returned to the soil via manure. 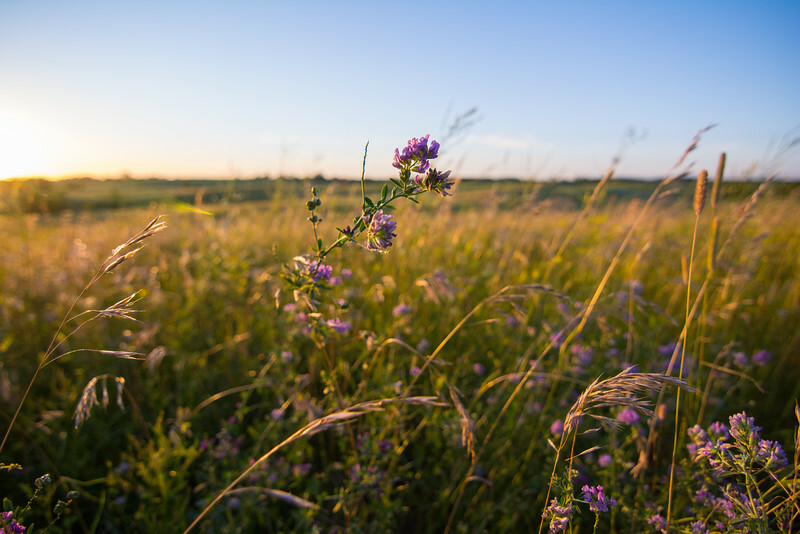 These natural processes are similar to the way bison used to graze the land and the result is a healthy prairie ecosystem full of wildlife and native plant species. After my visit to the Berge's property, I now have a whole new view of what a prairie is and how important it is to Minnesota's landscape. I can't wait to head back in September to see how what the landscape looks after it has been grazed!